This one makes the Internet occasionally. I didn't know this either - particularly because it isn't true. Not sure the purveyors of these silly stories are altogether clear on basic biology. 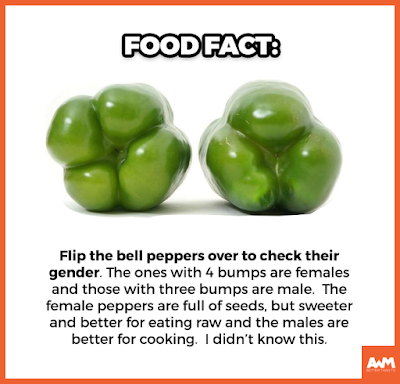 The fact is, bell peppers are a common fruit. In botany, a fruit is the seed-bearing structure in flowering plants formed from the ovary after flowering. This seed-bearing part of the plant is invariably regarded by biologists as "female". There is no such thing as a "male" bell pepper, although feeling bumps on the bottom may gratify the voyeuristic sense, in some titillating manner. I really have no idea if there is any substantive difference in the eating quality of 4-bump or 3-bump. It may well be true that one is better for cooking. I have never tested this hypothesis, and cannot speculate. But I am absolutely certain that the basis for this popular meme is totally false. This is a trivial example of the kind of phony "fact" commonly found around the Internet.